Google has been experimenting with rich snippets for quite a while now. Rich Snippets are extra media showing up in the SERP’s such as gold star reviews and author pics. There are several other categories of Rich Snippets but these were the two I targeted as they are most relevant for my clients. Google is experimenting with sites that have these microformats marked up correctly. If done properly Google will reward you with either a star rating for hReview or an author image for rel=”author”. Linda Buquet mentioned an added bonus in her Google Places Blog for Local Search so I finally put the time to implement this on devdag.wpengine.com so I would know how to do it for my clients. 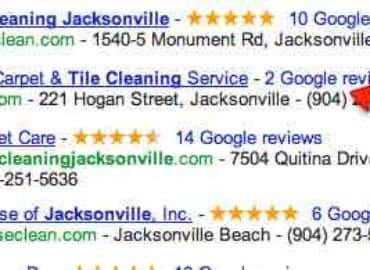 Mike Blumenthal made another good post about Google aggregating your reviews if marked up with hReview and showing them as part of your Google Places. I wasn’t intending on writing a blog myself as there are several good blogs about this, however I felt it would be valuable to condense it down to just the information about implementing hReviews on your site. You can create your own hReview using the hReview creator. One thing I will mention here is that you will want to be careful with the TYPE field. I set mine to “business” and Google gave a notice that hReviews would not be displayed in SERP’s for type = businesses and then went on to give the other types that would be displayed such as restaurants. I could not recreate this message for this post so it looks like Google has changed this. Regardless if you see a message like that you will want to leave the type field blank which will populate this attribute as “fn” for family name. I highlighted the attribute above to show the location in the code to look for. You can put this either in a widget or make a testimonial page like mine. I simply wrapped each review in the hReview format. One other thing worth mentioning about the hReview Creator is that you will want to manually edit the date field as it stops at 2008. I also deleted the last lines of code that displayed links back to the hReview creator. Normally I like to give credit but for the sake of my testimonials page I’ll have to give credit here in my blog. 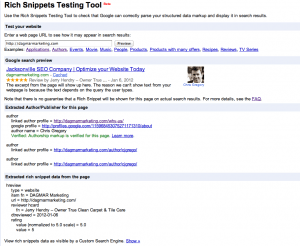 Once you have this setup and working on your blog you can test it using Google’s Rich Snippet Tester. 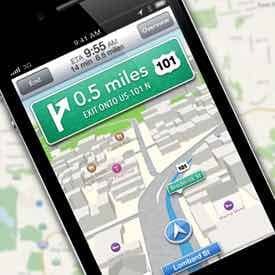 A successful test will look something like the image below. 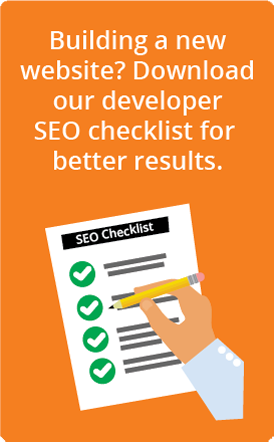 Once you have a successful test of your hReview markup done you will want to let Google know that you have implemented a Rich Snippet on your website. If you take the time to answer all the questions Google will reward you with gold stars on your listing within 2-3 days. That’s all there is to it. Of course things change so when that happens I will edit this page to keep it up to date. Resources: I found most of my information on a well made article from SEO Gadget. I felt the need to condense the resources sited on this blog into just what is needed to implement this on your site. I hope this was helpful. Thank you for your kind words. Theses instructions should be all you need. However, I have noticed that Google is weeding out the reviews for “organizations” like my site and some of my clients. I haven’t changed anything on my site since this article came out but Google has dropped my rich snippet. Google likes to show them more for sites that do reviews like yelp.com. I still see them appear though so it’s worth trying to figure it out. But don’t be surprised if the gold stars show for a while and then don’t. Hey, thats something worth implementing….. adding hReview…. Hi Chris, thank you for taking the time to create this article. It’s a simplified vesion for the use of Schema which is as you point out rewarding to implement.